The cell (from Latin cella, meaning “small room”) is the basic structural, functional, and biological unit of all known living organisms. A cell is the smallest unit of life. Cells are often called the “building blocks of life”. The study of cells is called cell biology or cellular biology. Cells consist of cytoplasm enclosed within a membrane, which contains many biomolecules such as proteins and nucleic acids. Organisms can be classified as unicellular (consisting of a single cell; including bacteria) or multicellular (including plants and animals). While the number of cells in plants and animals varies from species to species, humans contain more than 10 trillion (1013) cells. 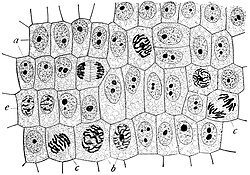 [clarification needed] Most plant and animal cells are visible only under a microscope, with dimensions between 1 and 100 micrometres. On the outside, flagella and pili project from the cell’s surface. These are structures (not present in all prokaryotes) made of proteins that facilitate movement and communication between cells. All cells, whether prokaryotic or eukaryotic, have a membrane that envelops the cell, regulates what moves in and out (selectively permeable), and maintains the electric potential of the cell. 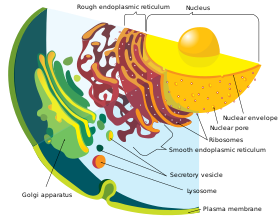 Inside the membrane, the cytoplasm takes up most of the cell’s volume. All cells (except red blood cells which lack a cell nucleus and most organelles to accommodate maximum space for hemoglobin) possess DNA, the hereditary material of genes, and RNA, containing the information necessary to build various proteins such as enzymes, the cell’s primary machinery. There are also other kinds of biomolecules in cells. This article lists these primary cellular components, then briefly describes their function. 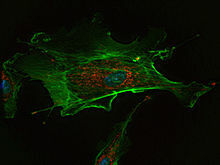 The cytoskeleton acts to organize and maintain the cell’s shape; anchors organelles in place; helps during endocytosis, the uptake of external materials by a cell, and cytokinesis, the separation of daughter cells after cell division; and moves parts of the cell in processes of growth and mobility. The eukaryotic cytoskeleton is composed of microfilaments, intermediate filaments and microtubules. There are a great number of proteins associated with them, each controlling a cell’s structure by directing, bundling, and aligning filaments. The prokaryotic cytoskeleton is less well-studied but is involved in the maintenance of cell shape, polarity and cytokinesis. The subunit protein of microfilaments is a small, monomeric protein called actin. The subunit of microtubules is a dimeric molecule called tubulin. Intermediate filaments are heteropolymers whose subunits vary among the cell types in different tissues. But some of the subunit protein of intermediate filaments include vimentin, desmin, lamin (lamins A, B and C), keratin (multiple acidic and basic keratins), neurofilament proteins (NF–L, NF–M). Foreign genetic material (most commonly DNA) can also be artificially introduced into the cell by a process called transfection. This can be transient, if the DNA is not inserted into the cell’s genome, or stable, if it is. Certain viruses also insert their genetic material into the genome. 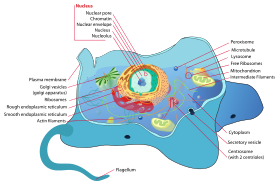 Cell nucleus: A cell’s information center, the cell nucleus is the most conspicuous organelle found in a eukaryotic cell. It houses the cell’s chromosomes, and is the place where almost all DNA replication and RNA synthesis (transcription) occur. The nucleus is spherical and separated from the cytoplasm by a double membrane called the nuclear envelope. The nuclear envelope isolates and protects a cell’s DNA from various molecules that could accidentally damage its structure or interfere with its processing. During processing, DNA is transcribed, or copied into a special RNA, called messenger RNA (mRNA). 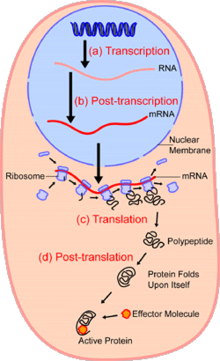 This mRNA is then transported out of the nucleus, where it is translated into a specific protein molecule. 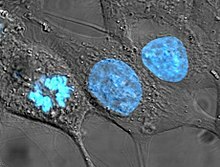 The nucleolus is a specialized region within the nucleus where ribosome subunits are assembled. In prokaryotes, DNA processing takes place in the cytoplasm. Mitochondria and Chloroplasts: generate energy for the cell. Mitochondria are self-replicating organelles that occur in various numbers, shapes, and sizes in the cytoplasm of all eukaryotic cells. Respiration occurs in the cell mitochondria, which generate the cell’s energy by oxidative phosphorylation, using oxygen to release energy stored in cellular nutrients (typically pertaining to glucose) to generate ATP. 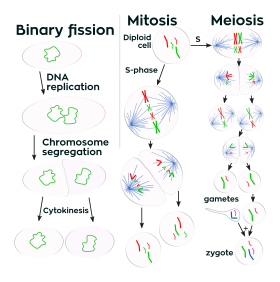 Mitochondria multiply by binary fission, like prokaryotes. Chloroplasts can only be found in plants and algae, and they capture the sun’s energy to make carbohydrates through photosynthesis. A gelatinous capsule is present in some bacteria outside the cell membrane and cell wall. The capsule may be polysaccharide as in pneumococci, meningococci or polypeptide as Bacillus anthracis or hyaluronic acid as in streptococci. DNA replication, or the process of duplicating a cell’s genome, always happens when a cell divides through mitosis or binary fission. This occurs during the S phase of the cell cycle. Between successive cell divisions, cells grow through the functioning of cellular metabolism. Cell metabolism is the process by which individual cells process nutrient molecules. Metabolism has two distinct divisions: catabolism, in which the cell breaks down complex molecules to produce energy and reducing power, and anabolism, in which the cell uses energy and reducing power to construct complex molecules and perform other biological functions. Complex sugars consumed by the organism can be broken down into simpler sugar molecules called monosaccharides such as glucose. Once inside the cell, glucose is broken down to make adenosine triphosphate (ATP), a molecule that possesses readily available energy, through two different pathways. 1665: Robert Hooke discovered cells in cork, then in living plant tissue using an early compound microscope. He coined the term cell (from Latin cella, meaning “small room”) in his book Micrographia (1665). 1953: Based on Rosalind Franklin‘s work, Watson and Crick made their first announcement on the double helix structure of DNA. ^ a b “Cell”. Online Etymology Dictionary. Retrieved 31 December 2012. The Alberts text discusses how the “cellular building blocks” move to shape developing embryos. It is also common to describe small molecules such as amino acids as “molecular building blocks“. ^ a b c d e f g h i j k l m n o p q r This article incorporates public domain material from the NCBI document “What Is a Cell?”. 30 March 2004. ^ Tero AC (1990). Achiever’s Biology. Allied Publishers. p. 36. ISBN 9788184243697. In 1665, an Englishman, Robert Hooke observed a thin slice of” cork under a simple microscope. (A simple microscope is a microscope with only one biconvex lens, rather like a magnifying glass). He saw many small box like structures. These reminded him of small rooms called “cells” in which Christian monks lived and meditated. ^ a b Schopf JW, Kudryavtsev AB, Czaja AD, Tripathi AB (2007). “Evidence of Archean life: Stromatolites and microfossils”. Precambrian Research. 158 (3–4): 141–55. Bibcode:2007PreR..158..141S. doi:10.1016/j.precamres.2007.04.009. ^ a b Schopf JW (2006). “Fossil evidence of Archaean life”. Philos Trans R Soc Lond B Biol Sci. 29 (361(1470)): 869–885. doi:10.1098/rstb.2006.1834. PMC 1578735. PMID 16754604. ^ Satir P, Christensen ST (June 2008). “Structure and function of mammalian cilia”. Histochemistry and Cell Biology. 129 (6): 687–93. doi:10.1007/s00418-008-0416-9. PMC 2386530. PMID 18365235. 1432-119X. ^ Blair, David F.; Dutcher, Susan K. (1992-01-01). “Flagella in prokaryotes and lower eukaryotes”. Current Opinion in Genetics & Development. 2 (5): 756–767. doi:10.1016/S0959-437X(05)80136-4. ISSN 0959-437X. ^ Michie KA, Löwe J (2006). “Dynamic filaments of the bacterial cytoskeleton”. Annual Review of Biochemistry. 75: 467–92. doi:10.1146/annurev.biochem.75.103004.142452. PMID 16756499. ^ Ménétret JF, Schaletzky J, Clemons WM, Osborne AR, Skånland SS, Denison C, Gygi SP, Kirkpatrick DS, Park E, Ludtke SJ, Rapoport TA, Akey CW (December 2007). “Ribosome binding of a single copy of the SecY complex: implications for protein translocation”. Molecular Cell. 28 (6): 1083–92. doi:10.1016/j.molcel.2007.10.034. PMID 18158904. ^ Ananthakrishnan R, Ehrlicher A. “The Forces Behind Cell Movement”. Biolsci.org. Retrieved 2009-04-17. ^ Ananthakrishnan R, Ehrlicher A (June 2007). “The forces behind cell movement”. International Journal of Biological Sciences. 3 (5): 303–17. doi:10.7150/ijbs.3.303. PMC 1893118. PMID 17589565. ^ a b c Grosberg RK, Strathmann RR (2007). “The evolution of multicellularity: A minor major transition?” (PDF). Annu Rev Ecol Evol Syst. 38: 621–54. doi:10.1146/annurev.ecolsys.36.102403.114735. ^ Popper ZA, Michel G, Hervé C, Domozych DS, Willats WG, Tuohy MG, Kloareg B, Stengel DB (2011). “Evolution and diversity of plant cell walls: from algae to flowering plants” (PDF). Annual Review of Plant Biology. 62: 567–90. doi:10.1146/annurev-arplant-042110-103809. hdl:10379/6762. PMID 21351878. ^ Bonner JT (1998). “The Origins of Multicellularity” (PDF). Integrative Biology: Issues, News, and Reviews. 1 (1): 27–36. doi:10.1002/(SICI)1520-6602(1998)1:1<27::AID-INBI4>3.0.CO;2-6. ISSN 1093-4391. Archived from the original (PDF, 0.2 MB) on March 8, 2012. ^ El Albani A, Bengtson S, Canfield DE, Bekker A, Macchiarelli R, Mazurier A, Hammarlund EU, Boulvais P, Dupuy JJ, Fontaine C, Fürsich FT, Gauthier-Lafaye F, Janvier P, Javaux E, Ossa FO, Pierson-Wickmann AC, Riboulleau A, Sardini P, Vachard D, Whitehouse M, Meunier A (July 2010). “Large colonial organisms with coordinated growth in oxygenated environments 2.1 Gyr ago”. Nature. 466 (7302): 100–04. Bibcode:2010Natur.466..100A. doi:10.1038/nature09166. PMID 20596019. ^ Orgel LE (December 1998). “The origin of life – a review of facts and speculations”. Trends in Biochemical Sciences. 23 (12): 491–95. doi:10.1016/S0968-0004(98)01300-0. PMID 9868373. ^ Griffiths G (December 2007). “Cell evolution and the problem of membrane topology”. Nature Reviews. Molecular Cell Biology. 8 (12): 1018–24. doi:10.1038/nrm2287. PMID 17971839. Cell Biology in “The Biology Project” of University of Arizona.